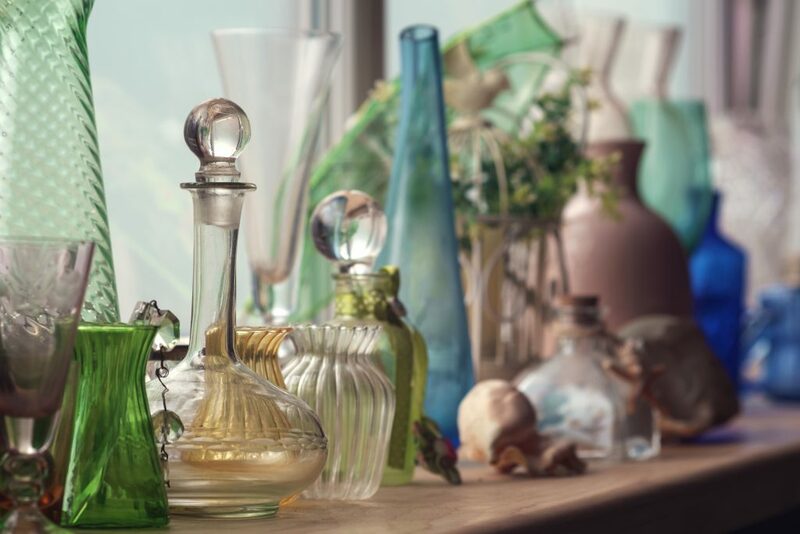 Why Does Your House STILL Feel Cluttered After You’ve Decluttered?! But the joy still isn’t sparked. You’ve followed all the decluttering tips checklists and donated all of your duplicate and extra items. You’ve purged your book collection and your closets. How disheartening to look around your home and still see clutter. Sometimes we get so hung up on following the checklists when purging that we forget to look at our unique surroundings to assess what is disrupting the clutter-free-flow. SHORT ON TIME? 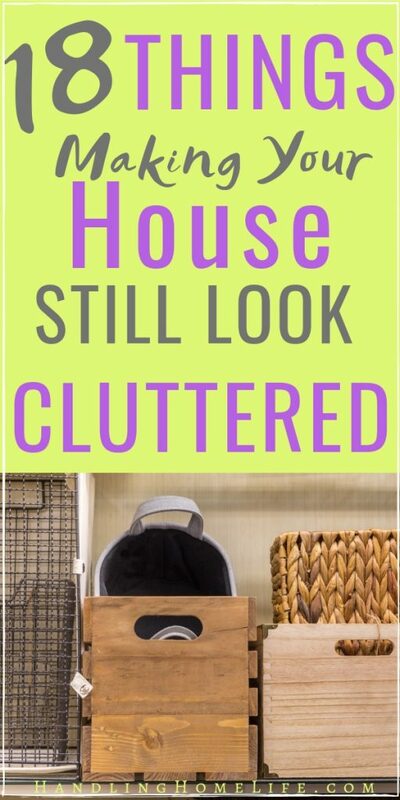 SAVE TO PINTEREST NOW & READ ABOUT THINGS MAKING YOUR HOUSE STILL LOOK CLUTTERED LATER! How Can I Make My House Look Less Cluttered? There are many areas of the home that we often overlook when we are clearing the clutter. These problem areas can really throw off the balance and vibe we want to create. We often overlook the importance of good lighting in our home. Dark corners and shadows can make a room feel gloomy and cluttered. Natural lighting is the ideal way to brighten things up. But, if you don’t have lots of sunlight available, you can get the feel with table lamps, floor lamps, and pendant lights. 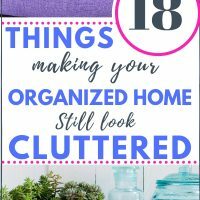 You’ve decluttered but you still feel like you have too much stuff! If you’re still feeling overwhelmed, take an honest look. Did you really declutter? Or did you hang onto things you thought you might need one day. Maybe you couldn’t part with things you intend to sell one day. Even worse, you packed crates and boxes with all of your “clutter” for the garage sale you will have some day. See what you can remove from the house today. Immediately take things you can donate to your car. If you really want to sell some of your things, make sure it will be worth your time and effort. Many times the tax deduction received from the charitable donation is much more beneficial. Random small objects often sabotage our decluttering efforts. These little items are usually attached to a happy memory and have great sentimental value. So how do we enjoy our beloved knick knacks without junking up our shelves? First, consider a ‘knick-knack rotation’. Then you don’t have everything out at once, but you still get to enjoy your entire collection. Sort your knick knacks with purpose and display the like items together. Then you won’t have things randomly scattered throughout the home which can look cluttered. If you have lots of tiny little objects, prevent clutter by placing them in an interesting box with a glass lid or in a pretty jar. Our refrigerator doors can quickly become a collection of kid’s artwork, photos, invitations, announcements, appointment reminders, take out menus, and so on. Consider clearing the clutter off of the fridge doors and organizing all of the info onto a family command center. You don’t have to leave the refrigerator doors completely bare….display a cute framed magnetic family photo and maybe a couple souvenir magnets. 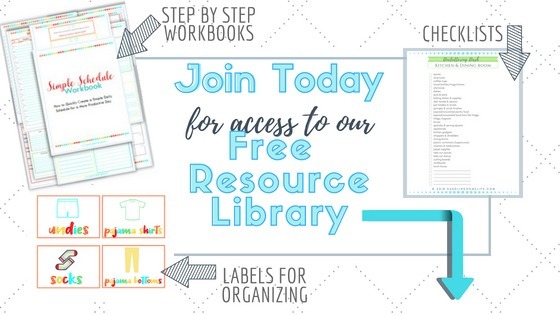 Use your family command center to organize all of the important paper and check out this post for all of the paper clutter solutions you could need! 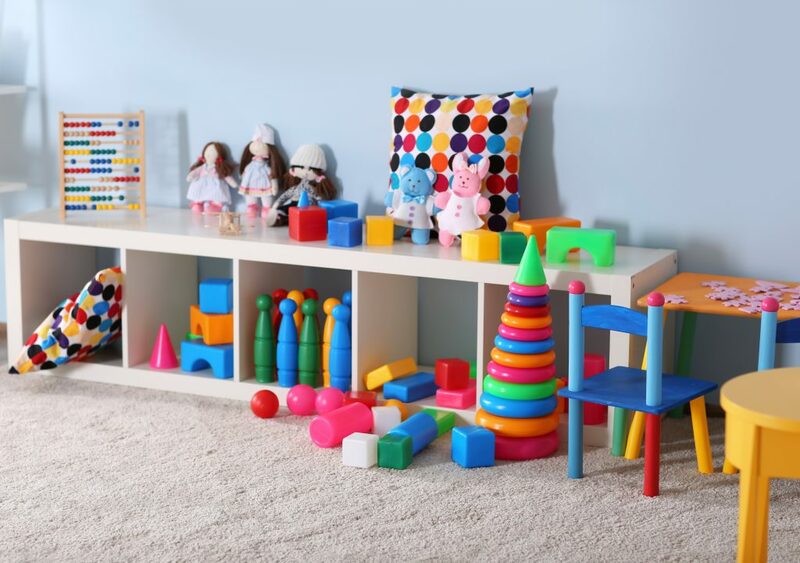 Toys in every room of your house will quickly make things look cluttered. Getting the playroom organized and teaching kids to put each activity away before getting another out will help with the toy clutter. Just because we straighten and pile up a stack of books doesn’t mean it’s not clutter. Immediately return items to their home and avoid the stacks and piles. Nothing clutters up a space worse than cords all tangled about. 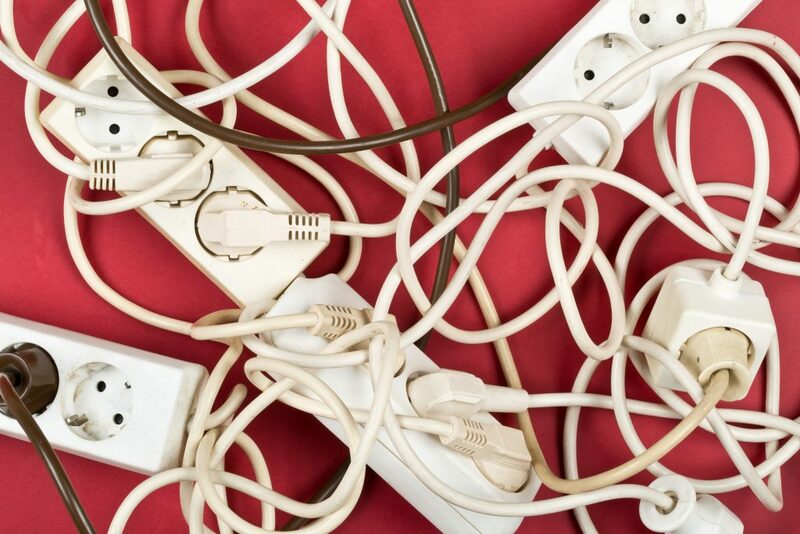 Cords and cables for electronics, phones, lamps, appliances, and such can create a jumbled eyesore. Take the time to corral the cords and neatly conceal them using cable clips or cord twist ties. I love to use various baskets made of natural materials around the house for storage. I can’t resist an interesting looking basket from a thrift store, and I’ve collected quite a few over the years. Taking a look around my house, I realized how many different colors my baskets were. It really made things look cluttered! I decided to give the baskets a quick and easy makeover. I used a whitish/gray paint and mixed in a bit of water to make the paint thinner. Then I just dipped my paint brush and quickly painted the baskets. It leaves a very thin layer of paint with hints of the original color still there. They dry very quickly and look so much more cohesive being similar colors. Too much fluff can really overwhelm a room. Take inventory of your sofa pillows and decide on a select few to keep. Wall to wall furniture can make a room feel cramped and cluttered. You want functional pieces of furniture that fit the space. 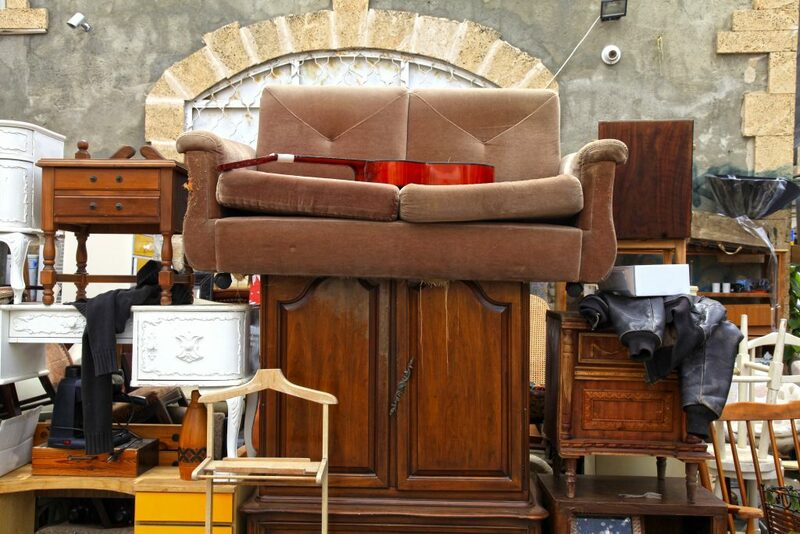 Maybe try just rearranging your furniture first— but if you still feel crowded then remove a piece or two. door rug and instantly brighten the entry. Your remotes will look neat and organized in a cute little basket or box. In addition, you will always know where to find a remote when you need it! Displaying countless family pics can lead to a cluttered look. Instead, create a family photo wall showcasing your very favorite prints. You can find inspiration here. Is it time to upgrade your pet’s bedding or food bowls? You can make things look tidy and coordinated with a comfy pet bed that matches your decor. Your furry friend will thank you and you’ll love how clutter free things will look. If you are still crating a puppy during the night, you can get a little crate cover to improve the look. 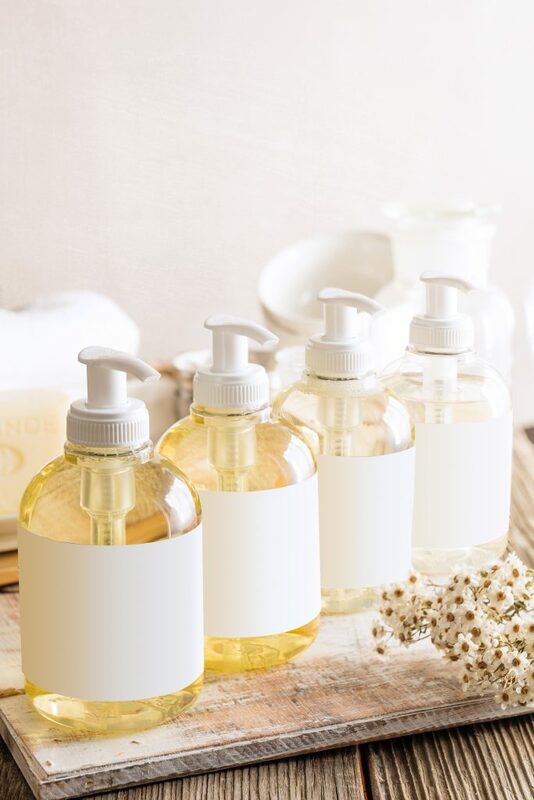 Shampoo, conditioner, body wash, hand soap…all of the different bottles can make your bathroom look cluttered. Purchase matching dispensers to transfer your toiletries to. It’s a little decluttering tip that makes a big impact. You don’t have to style your shelves like an interior designer, but make sure you aren’t cramming too many things onto shelves. Stacks and piles will look messy and cluttered. If you have a random assortment of bath towels then it might be time for a refresh. 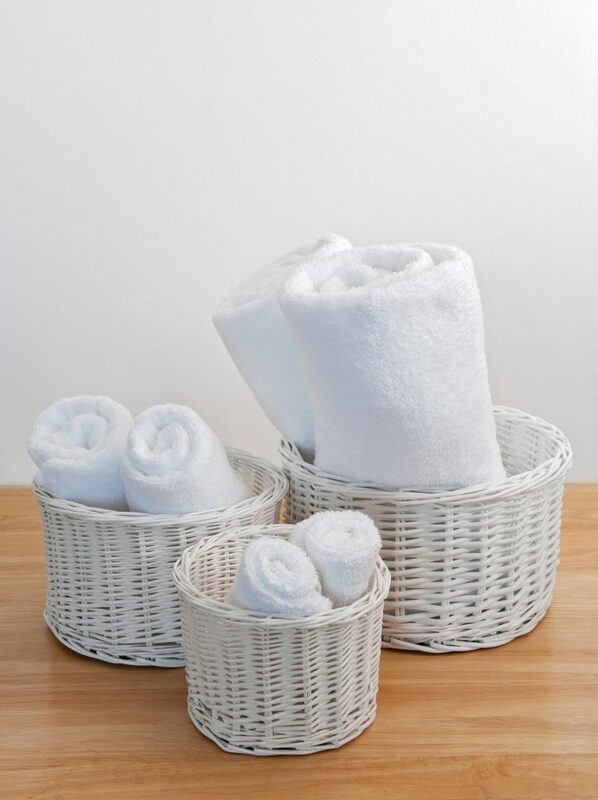 Retire the thin, worn towels and opt for higher quality bath linens. Choosing the same color or color scheme for all of your bath towels, wash cloths, rugs, etc., will look cohesive and much less cluttered. 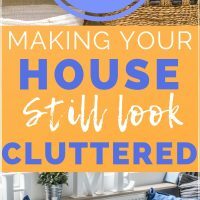 What “Comfortable Clutter” is making your home look messy? If you liked this and thought it was helpful, would you share to Pinterest or Facebook? It lets the search engines know that I provide quality content and helps keep my website alive. So many wonderful ideas Angela! Thank you so much for sharing, I’ve pinned this to my Home Organisation board to refer back to, I hope that’s ok? While reading this post I was nodding my head 🙂 With Hubby’s help, I’ve been trying to create order in our home for what feels like forever (I know it hasn’t been forever really but it so feels that way) and while we’ve made lots of improvements, it’s just not how I’d really like it to look. It just feels too cluttered still. I absolutely agree about the baskets 🙂 I adore my baskets and pretty boxes but one thing I’ve noticed while decluttering so far is that we ended up with so many storage items now sitting empty! I have a dear friend who is also decluttering so I took them along to her, she was so pleased and it was great that they went to a good home where they’d be loved as much as I had loved them. Rosie, what a great way to declutter the ‘too many’ storage items! I always feel much better knowing my ‘clutter’ went to a nice loving home! Thank you so much for saving to your Pinterest board…you are a doll! Thank you so much, Madeena! I’m so glad you liked the article and found some useful info to use! Forgot to thank you Angela for your inspiration.Bye for now and hoping to hear from you more and more useful and helpful ideas. I’m so glad you liked the basket idea! It definitely makes all of my beloved baskets look like they belong together! Thanks for reading!! I love your ideas. Where did the bottles come from in your “16. ugly bottles’” section? Those are adorable! I didn’t see a link. Thanks. I can’t wait to check out more of your posts. Hi Lee! I found some bottles that are similar on Amazon but I don’t think I’m able to link in the comments. I am going to go back into the post and include the link for you! Have a great day and thank you so much for reading!